Can a Felon Become a Chemist? Felons find it challenging to find a job after being released from prison. They often think no one will hire them, but there are resources available. Many employers have learned that felons make good employees, but they might have to start a different career. 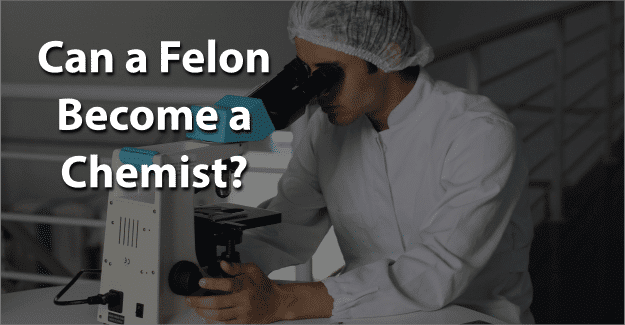 This blog post will address the issue of whether or not a felon can become a chemist. What Education/Training Does a Chemist Need? How Much Does a Chemist Earn? A chemist is a scientist who studies and tests chemicals. A chemist uses his or her knowledge to develop new and improved products, tests the quality of medications, and conducts research into new pharmaceutical treatments. A chemist studies substances at the atomic and molecular levels to see how substances interact with one another. He or she uses knowledge of chemistry to make new discoveries and to test the quality of manufactured goods. A chemist might work in basic research, investigating the properties, composition, and structure of matter. He or she also experiments with combinations of elements and how they interact. In applied research, a chemist investigates possible new products and ways to improve existing ones. The minimum requirement to obtain entry-level work as a chemist is usually a bachelor’s degree. To become a chemist will require a degree in chemistry or a related discipline, such as physical science, life science, or engineering. Required courses typically include inorganic and organic chemistry, biology, physics, mathematics, and computer science. For those wanting to teach at a university or do research, a Master’s degree or a Ph.D. may be necessary. No type of license is necessary to become a chemist. The American Institute of Chemists (AIC) offers certification of those who have attained a certain level of education and experience. Having this certification allows an individual applying for a job as a chemist to demonstrate competency in the field. The U.S. Bureau of Labor Statistics indicates that there are approximately 96,200 practicing chemists in the U.S. This occupation is expected to show a 7% growth by 2026 which is about average. The median salary of a chemist in 2016 was $73,740 annually. This is the salary at which half of chemists earned more and half earned less. Experience will make a difference in how much a chemist earns annually. The area of the country in which a chemist works also makes a difference in their earnings. Those on the East or West coast typically earn more than a chemist that works elsewhere. A felon can pursue any degree he or she wants. As many as 60% of colleges consider criminal history in their admissions process, although there is no standard policy regarding a background check. Any felon that wants to get a degree can find a college that will accept him or her. The challenge is in obtaining a job after graduating. It is important to be honest in filling out an application for certification as a chemist or when applying for a job as a chemist. If a felony isn’t disclosed but is found on a background check, this constitutes fraud and is punishable. It is a crime to falsify an application, which could result in being sent back to prison. In order to be successful, it is essential for felons to be honest about their background. They are already working with negative perceptions of being dishonest, untrustworthy, and unwilling or unable to follow directions from authority figures. Having their record expunged can give them the chance needed to begin with a clean record and succeed in becoming a chemist. Expunging a criminal record allows anyone to honestly state on an application that he or she has not been convicted of a crime. It is a big challenge, but it might be worth it for a felon wanting to become a chemist. Giving him or herself the best chance for success by having his or her record expunged and also documenting any programs, education, or training completed could be critical. What do you think about this blog post? Are you or someone you know been in the situation of trying to become a chemist with a felony? What was that like for them, and how did they achieve success? Please tell us in the comments below.